2. Find the Broken Altar to the right of the bonfire under The Hellkite Wyvern of the Undead Parish. 3. Pray to the altar. If you meet the requirements, you will have the option to enter the covenant. You will have an interaction window pop up. If you get no window, you do not yet meet the requirements. Players will appear as a Golden Phantom when summoned from a White Sign Soapstone. Upon clearing a boss as a Golden Phantom, all members (summoning players and other phantoms) are awarded a Sunlight Medal. Even the NPC Solaire will award you a Medal. Players of this covenant are matched up much more easily with other players in the same covenant during online play. You can get the Sunlight Spear by praying to the altar and giving Gwyn's soul. The only drawback from this covenant is that it doesn't make miracle resonance easier to happen, unlike the Way of White and Princess Guard where you can get miracle resonances. Once you have joined, by offering a certain amount of Sunlight Medals to the Altar located in the Undead Parish, you will be able to rank up. Leaving covenant removes the ability to use Miracle: Sunlight Spear. The two lesser spear miracles remain available for use. It's possible to completely eliminate the faith requirement for joining this covenant. However, the miracles need a high faith requirement, so characters who aren't heavily invested in faith may still not be able to use the Miracles granted by this covenant - e.g. Lightning Spear requires 20 Faith, so a character with Faith lower than 20 won't be able to use Lightning Spear. You don't need to actually join this covenant to get the Praise the Sun gesture, you only need to talk with the altar that is in Undead Parish (behind the Hellkite Wyvern). A good place to co-op bosses in NG+ for Soul Levels around 140, is the open area in New Londo Ruins as soon as you get off the elevator from Firelink Shrine. Also the bonfire on the balcony in Duke's Archive is a great place to co-op against Seath for Soul Levels around 140. The 25 Faith requirement was 50 Faith, before patch 1.04. As of Dark Souls 3, players speculate that the Nameless King is Gwyn´s firstborn. 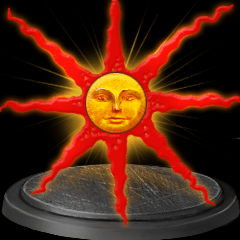 The Warriors of Sunlight were renamed "The Heirs of the Sun" in DS2. I have 35 faith and it won&apos;t let me join. So if anyone could shed some light on this I&apos;d be grateful: To join you need at the minimum 25 faith and that can be done with a bit of grinding. However, I also want to save Solaire and that process involves joining the Chaos Servants and being rank too after Blighttown, and then going to Demon Ruins/Lost Izalith and unlocking the short cut. I&apos;m stumped on which would be the better path covenant wise to go about this. Opt A. Join the sunbros, temporarily abandon them without giving the sunbro medals and then go off to save Soliare and rejoin the sunbros afterwards? Opt B. Save Soliare and do the Servants first and join the sunbros when its all done? I don&apos;t want to raise my faith to 25 so I help others as a white phantom. Like explained in the wiki, killing bosses as a white phantom reduces the faith level required by 5 (from 25 => 20, then 20 => 15, etc.). Do you know if I will have to do it once again in NG+ or is it linked to the character and not the playthrough? I ask that because the miracle only available in NG+ (those that requires Gwen&apos;s Soul). If I haven&apos;t turn in no medals and leave the covenant will I still get a penalty.... or will I just need 10 medals to rank 1 when I rejoin ??? Does anyone know if the penalty system is still in the remaster? How to eliminate the faith requirements? Praise that grossly incandescent sun baby!